Three bomb attacks in two tourist areas on the Indonesian resort island of Bali have killed at least 26 people - among them foreign nationals. More than 50 others were injured as blasts ripped through three restaurants - two in the Jimbaran beach resort, the third in Kuta 30km (19 miles) away. Indonesia's president said terrorists were to blame for the bombings - the second such attacks in three years. 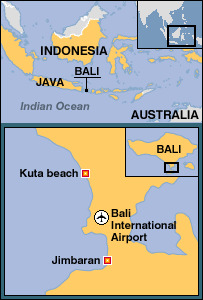 Bombings in Kuta in 2002 killed 202 people, many of them foreign tourists. Local TV has been showing pictures of bloodied and confused survivors and collapsed buildings. Local media said police had found a number of other unexploded devices. No group has claimed the attacks. However, BBC security correspondent Frank Gardner says the finger of suspicion is already pointing towards the extremist regional group Jemaah Islamiah (JI) which was blamed for the 2002 bombings. Bali - a predominantly Hindu island popular with Western tourists - represents a soft and tempting target for Islamist extremists linked to al-Qaeda, our correspondent says. Police say there were three blasts, which happened almost simultaneously just before 2000 local (1200GMT) on Saturday. A British tourist who was in a building next door to the restaurant that was hit in Kuta said there was a "thunderous boom" that caused all the shop's windows to blow out. "It was just chaos," Daniel Martin told the BBC. He said there were people lying in the streets with serious injuries, with everyone pitching in to help. Journalist Maris Bakkalupulo told the BBC that Raja's noodle and steak restaurant at Kuta was completely gutted. "Everything has been blasted out of the building, which is very mangled," she said. 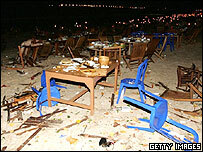 In Jimbaran, two outdoor beach restaurants about 100 metres (yards) apart were targeted. Dutch student Chris van der Draai described the panic that ensued. "We had a bit of panic, everybody panicked," he told the BBC, "but I think, with the first bomb, many people just stood up and everybody ran down to the beach... and the second bomb went off, so I think some people were very lucky that... both bombs weren't exploded together." Initial reports suggest that Indonesians bore the brunt of the attacks, but casualties also include Australian, US, Japanese and South Korean nationals. "These are clearly terrorist attacks because the targets were random and public places," said Indonesian President Susilo Bambang Yudhoyono. "We will hunt down the perpetrators and bring them to justice." Official statements from the US and UK have condemned the attacks and expressed support for the people of Bali. The blasts come less than two weeks before the third anniversary of massive bomb attacks that killed 202 people - including 88 Australians. JI, the group blamed for the 12 October 2002 bombings, is also suspected of being behind a suicide bombing at the Marriott hotel in Jakarta in 2003, and a suicide bombing at the Australian embassy last September. The authorities had warned that militants had been planning further attacks on Western targets in Indonesia, although there had been no particular alerts over the past few days. Did you witness Bali blasts?